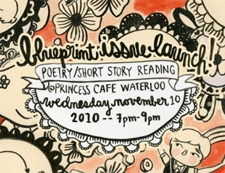 On November 10th, 2010, Blueprint hosted a poetry and short story reading at the Princess Cafe. Seventeen writers, poets, musicians, and performers from our campus and community took to the stage to and performed their original stories, poems and songs. If you missed the evening or were looking to experience it again, we’ll be posting performance videos throughout the next few weeks. Look for new performances posted here each Thursday! Performed by Michael Charpentier. Part 2 of 2. Performed by Michael Charpentier. Part 1 of 2. Performed by Erin Oldynski with guitar by Tyson Brinacombe.